When craft and hobby stores start displaying holiday decorations three months out of season (grrrr), it becomes particularly satisfying to ignore them and make one’s own festive decor using stuff already on hand around the house. Especially if you’re using craft supplies from other holidays. 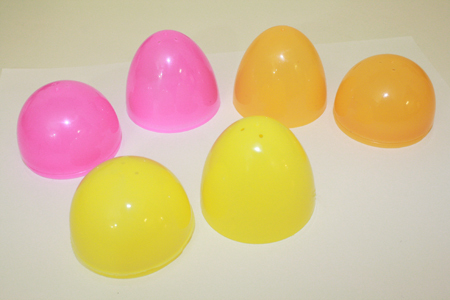 I’ll definitely be stocking up on cheap plastic Easter eggs this spring, as I have been continually discovering great crafting uses for them. 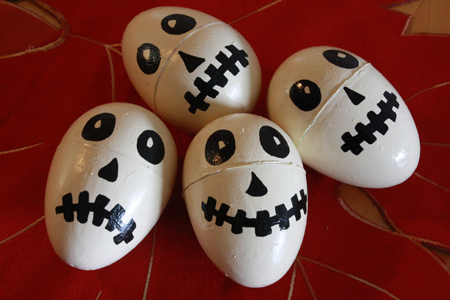 In any case, when I looked at those skull boxes I immediately thought of Easter eggs. 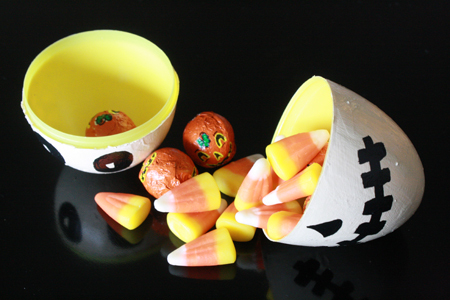 Use little plastic eggs and you have pre-made container, all you have to do is paint it. Brilliant! 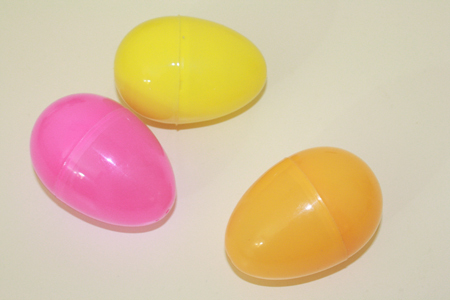 (Not that you can get plastic Easter eggs in the store this time of year either, but I feel one is not unlikely to have some of those lying around from the previous spring, or to have a friend who does.) Here’s how to do it. 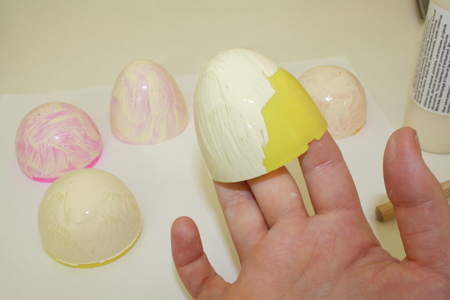 1) Snap your Easter egg or eggs in half and set the halves flat on a piece of scrap paper or newspaper (to catch any stray paint smears). 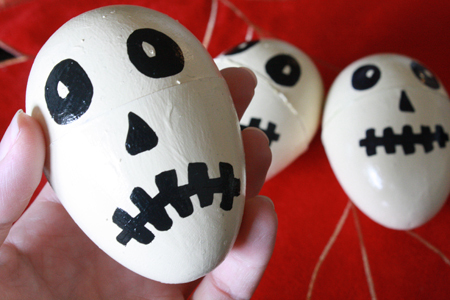 2) Use your acrylic paint to cover the outside of each Easter egg half. 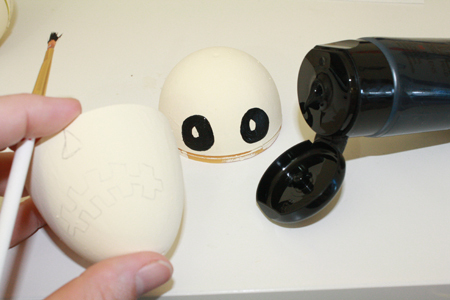 For the bottom half of the eggs, you can hold it by that little inner ledge that snaps the two halves together, and which does not need to be painted. For the top half of the eggs, I get my fingers in there and spread them apart, pushing firmly on opposite sides of the egg to keep it from flying off my fingers while I paint all sides of it. 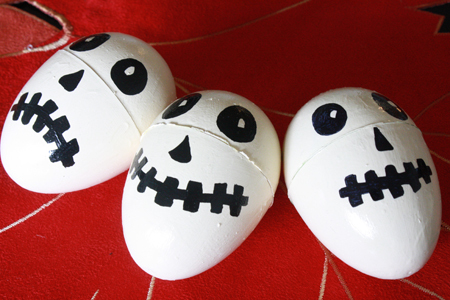 To do a large number of eggs at once, you could also simply spray paint them. Just put all the egg halves in a cardboard box with reasonably deep sides (to protect everything else from the paint), and spray liberally (probably best to do this outside). Do several coats, letting them dry between, as with the acrylic. 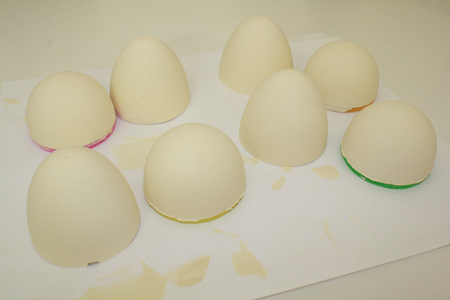 Be sure to move the eggs between coats, to make sure that the paint at the bottom of the eggs doesn’t stick them to the cardboard. Then proceed with the rest of the tutorial. 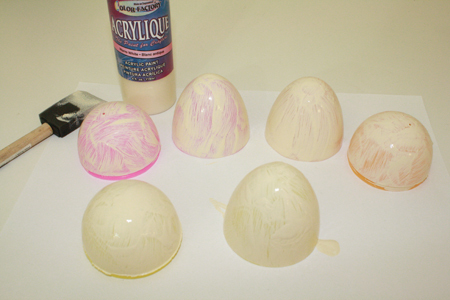 You’ll need to do 3 – 5 coats on each egg, but one nice thing about acrylic is it dries pretty quickly. Be sure to let the paint dry between coats. 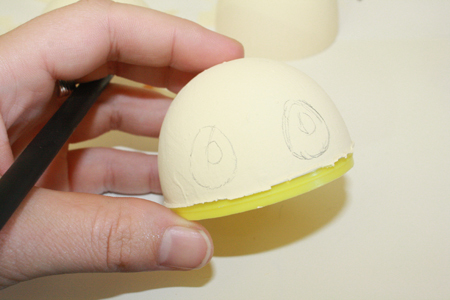 3) Once enough coats of paint have been applied (none of the egg’s original colour should be visible through the paint) and the paint is completely dry, use a pencil to lightly sketch a face onto the egg. Eyes on one half, nose and mouth on the other half. I find it works best to put the eyes on the bottom, shorter half of the egg, and the nose and mouth on the longer, top half. That said, you can do it either way – I tried eggs in both directions, and they both worked. 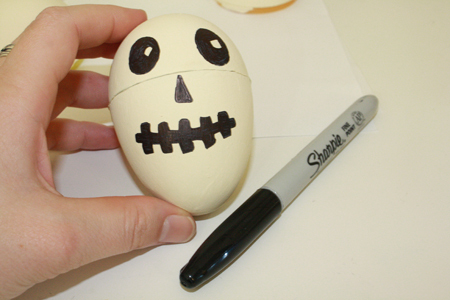 4) Use a tiny paintbrush and black paint OR a black sharpie or paint pen to put features on your egg. Paint and paintbrush are slower and take more careful precision and a very steady hand. Sharpie is easier, but I found that the paint slowly messed up the sharpie a bit, even when dry, and when putting a protective coat of varnish over the egg later, the varnish smeared the sharpie a little. I think a black paint pen would be the happy medium here, colouring overtop of the white paint more easily, but still giving you lots of precision. 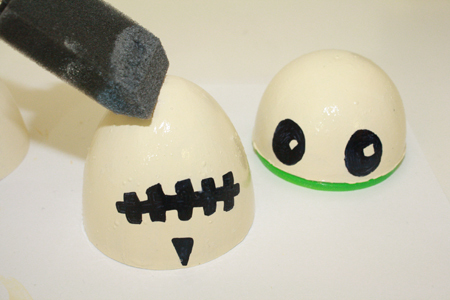 5) When the black paint or ink is entirely dry, put one or two coats of varnish on each half of the egg. This goes quite a way to help keep the paint from chipping off, as paint on plastic is not the most lasting combination. 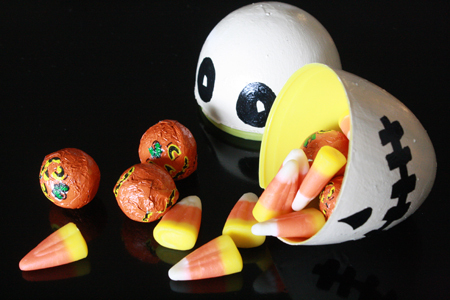 5) Display for extra spooky cuteness at your Halloween party, and/or fill with candy or small toys. Hi there! This is a terrific idea. Thank you for the detailed instructions. I wonder if spray paint for plastics would work–the kind people use on their plastic lawn chairs? I’ve never tried the stuff myself so I don’t know, but just a thought to maybe eliminate the step with the varnish. Cute idea! I’m sure I’ve got some of those plastic eggs floating around the house somewhere! I know on Mr Maker (a BBC kids show we all love at our house) when he paints a plastic item, he adds ‘gloopy glue’ otherwise known as PVA glue ;) into the paint mix to help the paint adhere to the plastic. Haven’t tried it myself, but it sounded feasible to me! These are so cool! I’m making one for my friend because her b-day is coming up soon. I made her a bracelet that’s going inside of the skeleton, so I’m kinda giving her a gift within a gift. Hi! Seventeen is working on a Pinterest DIY Story for the website, and we were hoping to use a few of these images for the piece. We would, of course, credit and link back to you as a source. Please let me know at your earliest convenience if this would be okay! Best, Kara PS: Sorry for reaching out via comment — I couldn’t find a contact e-mail! Is it possible to have 2 drives in raid and 1 just normal?